The graphicEQ System object™ implements a graphic equalizer that can tune the gain on individual octave or fractional octave bands. The object filters the data independently across each input channel over time using the filter specifications. Center and edge frequencies of the bands are based on the ANSI S1.11-2004 standard. Create the graphicEQ object and set its properties. Call the object with arguments, as if it were a function. To learn more about how System objects work, see What Are System Objects? (MATLAB). equalizer = graphicEQ creates a graphic equalizer with default values. equalizer = graphicEQ(Name,Value) sets each property Name to the specified Value. Unspecified properties have default values. Example: equalizer = graphicEQ('Structure','Parallel','EQOrder','1/3 octave') creates a System object, equalizer, which implements filtering using a parallel structure and one-third octave filter bandwidth. Unless otherwise indicated, properties are nontunable, which means you cannot change their values after calling the object. Objects lock when you call them, and the release function unlocks them. If a property is tunable, you can change its value at any time. For more information on changing property values, see System Design in MATLAB Using System Objects (MATLAB). '1 octave' –– Specify gains as a 10-element row vector. '2/3 octave' –– Specify gains as a 15-element row vector. '1/3 octave' –– Specify gains as a 30-element row vector. Example: equalizer = graphicEQ('Bandwidth','2/3 octave','Gains',[5,5,5,5,5,0,0,0,0,0,-5,-5,-5,-5,-5]) creates a two-third octave graphic equalizer with specified gains. You can tune the gains of your graphic equalizer when the object is locked. However, you cannot tune the length of the gains when the object is locked. Order of individual equalizer bands, specified as a positive even integer. All equalizer bands have the same order. Filter bandwidth in octaves, specified as '1 octave', '2/3 octave', or '1/3 octave'. The ANSI S1.11-2004 standard defines the center and edge frequencies of your equalizer. The ISO 266:1997(E) standard specifies corresponding preferred frequencies for labeling purposes. Type of implementation, specified as 'Cascade' or 'Parallel'. See Algorithms and Graphic Equalization for information about these implementation structures. Input sample rate in Hz, specified as a positive scalar. audioOut = equalizer(audioIn) performs graphic equalization on the input signal, audioIn, and returns the equalized signal, audioOut. The type of equalization is specified by the algorithm and properties of the graphicEQ System object, equalizer. Audio input to the graphic equalizer, specified as a matrix. The columns of the matrix are treated as independent audio channels. Audio output from the graphic equalizer, returned as a matrix the same size as audioIn. Design and create an object for graphic equalization and then perform equalization on an audio signal. Create objects to read from an audio file and write to your audio device. Use the sample rate of the reader as the sample rate of the writer. In an audio stream loop, read audio from a file and play the audio through your audio device. Create a one-octave graphic equalizer implemented with a cascade structure. Use the sample rate of the reader as the sample rate of the equalizer. Specify to increase the gain on low frequencies and then visualize the equalizer. In an audio stream loop, read audio from a file, apply equalization, and then play the equalized audio through your audio device. Create a dsp.AudioFileReader to read in audio frame-by-frame. Create an audioDeviceWriter to write audio to your sound card. Create a graphicEQ to process the audio data. 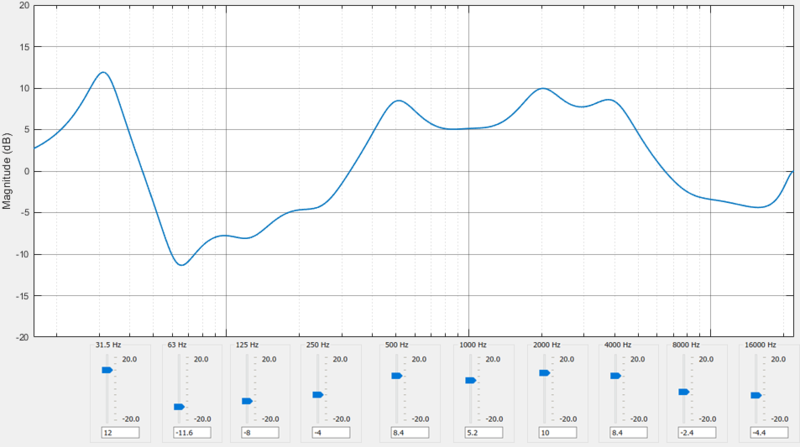 Call visualize to plot the frequency response of the graphic equalizer. Call parameterTuner to open a UI to tune parameters of the equalizer while streaming. Read in a frame of audio from the file. Write the frame of audio to your audio device for listening. While streaming, tune parameters of the equalizer and listen to the effect. As a best practice, release your objects once done. The implementation of your graphic equalizer depends on the Structure property. See Graphic Equalization for a discussion of the pros and cons of the parallel and cascade implementations. Refer to the following sections to understand how these algorithms are implemented in Audio Toolbox™. The parallel implementation designs the individual equalizers using the octaveFilter design method and spaces them on the spectrum according to the ANSI S1.11-2004 standard. The final bandpass filter is the one whose upper bandpass edge is less than the Nyquist frequency. The final filter is implemented as a highpass filter designed by the designParamEQ function. The input signal is fed into a filterbank of M filters, where M depends on the specified Bandwidth and SampleRate properties. Each branch of the filterbank is multiplied by the linear form of the corresponding element of the Gains property. The branches are summed and the output signal is returned. The cascade implementation designs the graphic equalizer filter bank using the multibandParametricEQ System object. If the EQOrder property is set to 2, then a gain correction is calculated according to . The gain correction is independent of the requested gains. The gain correction is recomputed during the real-time processing only if the SampleRate property is modified. If the EQOrder property is not set to 2, no gain correction is applied, and the requested gains are passed on to the multibandParametricEQ object. The input signal is fed into a cascade of M biquad filters, where M depends on the specified Bandwidth and SampleRate properties. Oliver, Richard J., and Jean-Marc Jot. "Efficient Multi-Band Digital Audio Graphic Equalizer with Accurate Frequency Response Control." Presented at the 139th Convention of the AES, New York, October 2015. Acoustical Society of America. American National Standard Specification for Octave-Band and Fractional-Octave-Band Analog and Digital Filters. ANSI S1.11-2004. Melville, NY: Acoustical Society of America, 2009.
 International Organization for Standardization. Acoustics –– Preferred frequencies. ISO 266:1997(E). Second Edition. 1997. Generate C and C++ code using MATLAB® Coder™.